Each week this month I am sharing on a different topic related to your baby's eating habits. Healthy eating habits can and should start as soon as your baby starts eating solid food around 6 months of age and this series is meant to provide relevant information and build knowledge that will help you encourage healthy eating habits. I'm an RN (BSN) by degree and while these opinions are my own, they are based on 5+ years of college education, both personal and professional experience and significant research. 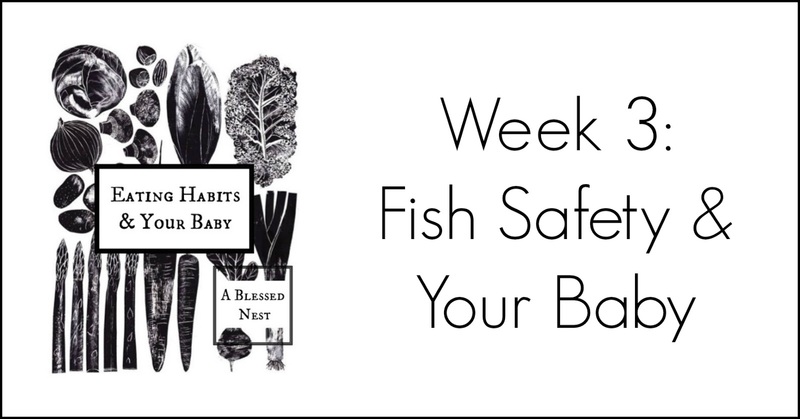 This week I'll be sharing about fish safety for your baby as well as some basic fish preparations and our favorite types of fish to feed Olivia. Fish is probably the most "untraditional" baby food that Olivia eats, but it's also her absolute favorite. My husband and I have always eaten a lot of fish, and I ate wild caught salmon almost once a week throughout my pregnancy, so it's no surprise that we offered it to Olivia at an early age and that she enjoys it as much as we do. Even now, Dustin and I eat fish 2-3 nights a week. It is packed with so many nutritional benefits -- low in saturated fat, high in Vitamin D and many of the B vitamins and high in protein -- and there are so many easy ways to prepare it! So while it's not traditional, it contains so many brain-building nutrients that your baby will benefit from, that if you haven't tried it yet, I suggest you try it soon! It is widely known that a child's health and behavior are affected so significantly by what they eat. However, for many years, fish was missing from most babies' diets. Parents just didn't seem to think that fish was a "baby food." Unfortunately, the protein that babies need is often missing from their diet also, and instead is being replaced with sugar-filled fruit and high-carb grains. My number one recommendation no matter who I am talking to or what age their baby is: feed your baby protein at every meal! Fish is a great source of protein and as long as it is properly sourced (wild caught), a baby will benefit immensely! Omega-3 fatty acids -- the type found in most seafood -- help promote infant brain development as well as boost immunity and vision. In fact, these fatty acids are good for nearly every organ -- including skin! Even moms can benefit: the latest research shows that mothers who ate adequate amounts of omega-3 fatty acids during their pregnancy were less likely to suffer from postpartum depression. Further, fish contain all 9 amino acids -- meaning that fish is one of the few complete sources of protein and since our bodies do not make amino acids, we must get them from the food we eat. What types of fish are best for baby? Salmon is by far the best source of DHA* - the star of the omega-3 world which is vital for brain and eye development; almost all seafood contains omega 3s, just be sure to choose varieties that are lowest in mercury. When should you introduce salmon? Once you've introduced solids to your baby (avocado, sweet potato, cooked egg yolk, etc. ), try salmon -- around 6 months of age. The sooner you introduce it, the more likely it is your baby will like it. Two weeks after Olivia started solids, we began giving her salmon. We mixed it with sweet potatoes and she went crazy for it! What kind of salmon (fish) should you buy? Regardless of the origin (the body of water it comes from), be sure your fish is always fresh/wild caught and never farmed (to keep it simple, farming has negative effects on both the fish and the environment)! Our favorites are Wild Alaskan Sockeye Salmon & Wild Pacific King Salmon and Wild caught Alaskan cod. Keep in mind that when salmon says "fresh" it does not necessarily mean wild caught! Our local grocery stores often sell "Fresh Norwegian Salmon" but in tiny letters below it reads: "Farmed"
Start by choosing a fish that is mild in flavor, such as cod or salmon, that can be prepared easily (such as by baking) and that flakes well and therefore will blend well with other vegetables. Introduce it in a small amount mixed with one other vegetable. Continue to offer it and see the response you get. Honestly, the first time my aunt (an RD) recommended salmon for Olivia, I thought it would be so weird to give my 6 month old pureed fish. In fact, I was a little disgusted. Turns out, it was one of the best food decisions I made. Try fish with different foods and experiment. Have fun with what you cook for your baby and don't be discouraged if you have to offer it a few times before they get hooked. Dustin and I even love the purees we make for V -- especially cod with carrots, parsnips and butternut squash. Even just cod with a little bit of real butter on it...it's so yummy and like a dessert for Olivia! Finally, buy your fish when it is on sale; we stock up on ours when the prices are at their lowest. Lunds & Byerly's often offers BOGO on both wild caught sockeye salmon filets and wild caught alaskan cod filets every few months. They also often reduce the price on a regular basis (such as $5 off per pound). When sales happen, we buy a lot. We freeze it all and I take it out as I need it. I bake it in the morning and prep it for Olivia's lunch and dinner during her nap time. Pay attention to the ads at the stores you shop the most at, and don't be afraid to ask the fish mongers when the sales are coming. They often know what their supply will be in the coming days and I always ask about sales before I buy at full price. In fact, I rarely ever buy at full price because I always stock up during sales! If you have any questions about fish preparation or fish safety, consult your pediatrician or a registered dietician. I am happy to answer any questions to the best of my ability as well. I would love to hear if you introduce fish to your babe and how it goes, as well as your favorite fish food combinations!